This tutorial aims to succintly present step-by-step instructions to setup Jenkins on Mac OSX and CentOS, both locally and in various cloud enviornments. I want you to feel confident that you’ve mastered this skill. That’s why this takes a hands-on approach where you type in commands and we explain the responses and possible troubleshooting. This is a “deep dive” because all details are presented. Like a good music DJ, I’ve carefully arranged the presentation of concepts into a sequence for easy learning, so you don’t have to spend as much time as me making sense of the flood of material around this subject. Sentences that begin with PROTIP are a high point of this website to point out wisdom and advice from experience. NOTE point out observations that many miss. Search for them if you only want “TL;DR” (Too Long Didn’t Read) highlights. Stuck? Contact me and I or one of my friends will help you. Jenkins invokes other programs (maven scripts, build, Selenium, JMeter, etc.) for building software, conducting tests, etc. Jenkins can invoke jobs on a schedule, but it’s called a “continuos integration” (CI) tool because it can invoke jobs when a trigger is fired. Jenkins can orchestrate a chain of tasks that kicks off each step in sequence based on the ending status of the previous step, such as to ensure that components already unit-tested can be integrated together. For scaling, several slaves can be setup to run simultaneously. Jenkins is open-source software written in Java. So you’ll need to first install Java 1.5 or higher. If you download Jenkins, it’s a jenkins.war file. It contains a Tomcat web server Java runs under. Installation is not necessary if you use Cloudbees.com which hosts Jenkins in their cloud. Their CEO is Kohsuke Kawaguchi (@kohsukekwa, kk@kohsuke.org) who invented Hudson/Jenkins. 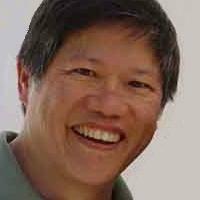 Hear him speak at this Oct, 2014 meetup about Workflow. Cloudbees sells Nectar, a supported and enhanced on-premise version of Jenkins that automatically scales on VMWare virtual machines. Cloudbees has a professional certification exam on this product. is the demo Docker image for Jenkins workflow with Jenkins Enterprise by CloudBees proprietary extension for checkpoint. this is the open source version of Jenkins. The response can take a long time. The --rm option tells Docker to automatically clean up the container and remove the file system when the container exits, according to Docker reference, which describes many other options. Also, many add --name to spacify a name to the container. NOTE: The long form of -p is --publish to the Docker container. Jenkins runs on port 8090 reassigned from the default 8080 port. PROTIP: Remember that the reassigned port to to the left of the default port. The Jetty web service runs on port 8081. Port 2222 is to access the Jenkins CLI. Port 8022:22 is SSH to securely access Git repositories. Port 9418 is to use the Git protocol which is similar to SSH, but with no authentication. Thus it’s often the fastest network transfer protocol available, but for read-only (no pushing to it). However, the need to open a special port makes this rare for enterprise use. Highlight the password and press Ctrl+C to copy it to your invisible Clipboard. Proceed to Unlock Admin password in this tutorial. Instantiate a CentOS droplet (instance) per this doc (Centos with 512 MB, SFO 2). Click on the name of the droplet listed (such as “centos-512mb-sfo2-01”). Click Access, then “Reset Root Password”. Copy the password and paste it to a safe place. Click on the IP address. Alternately, for Windows, use Putty. The authenticity of host '138.68.1.138 (138.68.1.138)' can't be established. ECDSA key fingerprint is SHA256:vwQzKkAHmgwCouPC8wY3qEimOMj+etG/35GMRQKrD28. Warning: Permanently added '138.68.1.138' (ECDSA) to the list of known hosts. There were 4544 failed login attempts since the last successful login. Type in another made-up (strong) password. Twice. If you want to add users see this. There are two basic ways to install Jenkins on CentOS: through a repository, or repo, and via a Java WAR file. Installing from a repo is the preferred method. QUESTION: What version of Jenkins? Connecting to pkg.jenkins-ci.org (pkg.jenkins-ci.org)|52.202.51.185|:80... connected. NOTE: The wget tool downloads files into the filename specified after the “O” flag (that’s a capital ‘O’, not a zero). There is no response if successful. “Active: active (running)” means the Jenkins services completed its startup and is running. “Active: Active (exited)” stop and start the service again, as described below. NOTE: It may take several minutes for the server to come up. Update current Version of Jenkins through repo on Digital Ocean SaaS using Putty for Windows. Connect to the Digital Ocean server via Putty. Login to the GitHub account to be referenced from within Jenkins. For Token Description, enter “jenkins”. Check “repo” and “adminrepo_hook” and all under them. Copy the token content to your clipboard. Go to Jenkins server, Manage Jenkins, Global Toll Configuration. In Git, add Name “Git”, Path: “git” (doesn’t matter). Click Save. Go to Jenkins server, Manage Jenkins, Configure System. Go to AWS CloudFormation service, Create stack. Create a CloudFormation template based on this one. Specify a Stack name according to your organization’s naming standards. (For now we use “Jenkins1”). For Parameters, select an Instance Type (t2.micro). For YourIPRange, type “0.0.0.0” to expose it to the world. Next. Options: Tag a key not necessary. Advanced notification options and stack policy not used for now. Next. Check acknowledge resource creation (to talk to CodePipeline). Click Create in the Summary page. Status goest from CREATE_IN_PROGRESS to CREATE_COMPLETE. If you have a prefer to select your own server sizes on EC2, Jenkins can be hosted on the Amazon cloud several ways. However, there are some updates necessary two years later. Google provides a Container-optimized OS. Deploying software on VM boot using a startup script or cloud-init. PROTIP: Install Jenkins locally for experimentation. If Java is not installed on your computer already, it will be installed as a dependency. the command shell, you should ensure "Run as Administrator". ou accept the license for 'jenkins' and each dependency you are installing. none detected. Check log for errors if unsure. Notice Java is installed on path C:\Users\%User%\AppData\Local\Temp\chocolatey\jenkins, where %user% is what’s on your own computer. After you install to Program Files(x86). Install 2.7.1. Finish. A web server is automatically created on localhost:8080 and pops up an Authorization. But what is the User Name and Password? Start, stop, and kill the server. The command to start Jenkins has several parameters. See https://wiki.jenkins-ci.org/display/JENKINS/Starting+and+Accessing+Jenkins for a full explanation, inclidiong use of nohup. INFO: Jenkins is fully up and running. NOTE: This command takes a minute or more. PROTIP: Do not stop the Jenkins instance by clicking the red X to close the command window Jenkins runs under. Doing a soft-stop enables Jenkins to save data to memory rather than potentially lose data during a hard and sudden stop. Stop the server by escaping the process. PROTIP: Encrypt over the wire by using https instead of https. Value -1 turns off the port. –httpListenAddress=0.0.0.0 allows remote access, while 127.0.0.1 does not. NOTE: Some use a domain name to reach the IP address. Open a new Terminal session. Copy the password revealed and dismiss the editor window. Click in the Administrator password field and press Ctrl+V to paste the password from your Clipboard. CAUTION: Close the window showing the log would shut down Jenkins. Return to the web page and paste it under “Administrator password”. PROTIP: DO NOT click “Install the Suggested Plugins” Recommended. PROTIP: Configure one plug-in at a time. This makes it easier to troubleshoot. Click Select plugins to install. NOTE: Click the Suggested link at the top of the screen to reset selections. TROUBLESHOOTING: This error appears if Jenkins timed out: “An error occurred during installation: No valid crumb was included in the request”. Jenkins restarts on its own. The “Getting Started” page shows the progress of plug-ins being installed. PROTIP: Open a text file and type your choice for Username, Password, Confirm, Full Name, E-mail address. Do this in case there is a typo. Copy each answer from the file and paste it on the screen. PROTIP: Print the file and store it in a safe place but where other administrators know to access. Type in the credentials entered earlier. The whole page is called a Dashboard. Breadcrumbs show the hierarchy of page navigation. Menu items are within a Sidebar. Under the Build Queue heading. Under the Build Executor Status heading. To the right of the All view ??? Under the Name column are jobs and projects. Different colors of icons under the S column indicate differing build status. Different colors of icons under the W column indicate differing uild trend, where yellow sunshine is good and a thundercloud is bad. By default, Jenkins stores its configuration files in the user’s home folder at ~/.jenkins. To make a Jenkins server completely public (and open to hacking) use a text editor to edit ~jenkins/.ssh/config to add StrictHostKeyChecking no. Copy your github key to Jenkins .ssh folder. If you don’t see the full menu (shown on the right), you don’t have some permissions. As with other systems, granting permissions is typically done only by the Administrator of the system. Click Manage Jenkins on the left menu of the Dashboard screen. Check the option box for Enable Security. If you have an LDAP, select that. Under the Access Control section, Check Use Jenkin’s own user database. But you’ll have to add each user. 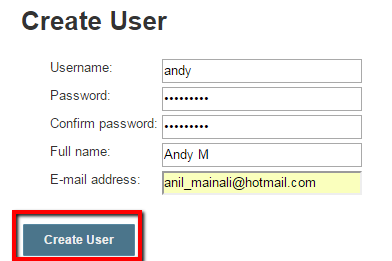 Deselect the checkbox marked Allow users to sign up. Under Authorization, Check Matrix-based security. Click on the small button to the right of the Anonymous row to select all permissions. PROTIP: Rather than specifying individual users and their permissions, the preferred approach is to first assign individual users to a group in LDAP, then assign permission to the group (like what the Windows OS does). 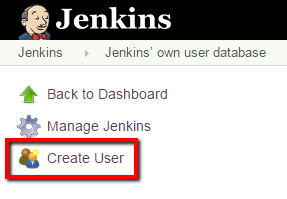 To create a new user, manually create additional new users by Returning to Home and Click on Manage Jenkins. Scroll down and click on Manage Users. From the menu on the left, Click on Create User. Click on the small button to the right of the andy row to select all permissions. Click Apply and Click Save. Install the “AWS CodePipeline Plugin” by following the next section below. From “Manage Jenkins”, click Global Tool Configuration. Unable to auto-install JDK until the license is accepted. Check “I agree to the Java SE Development Kit”. Click on “Please enter your username/password” and enter your Oracle credentials before returning. A Jenkins server can scale by adding nodes to spread build work across several servers running different operating systems. Look at the Load Statistics UI to see whether additional nodes are necessary. Setup a node as a VirtualBox. TODO. In Configure Server, a node can be setup as a Virtualbox URL such as http://localhost:18083/. In Manage Nodes, configure a VBox host. Run the box by clicking the icon at the far right of the node listed. Launch Slave Agent to start the machine. Several executors can be running simultaneously. This number is specified within the Manage Jenkins UI. Tool locations (such as Github) is also specified in that UI. Jenkins was initially created for automating the building (compilation) of java programs. But Jenkins is ALSO used for other types of work. Nevertheless, the Jenkins term “build” is another word for what operating systems call a “job” (unit of batch work). Follow @jenkins_release This bot tweets Jenkins plugin releases. @changelog New podcast every Friday! Sign up for our weekly and nightly emails. Open source moves fast. Keep up. Jenkins beta certification exam by Jeanne Boyarsky, 27 Feb 2016 shares a word file and quizlet that enabled her to pass. Download Jenkins: The Definitive Guide (as 371 page PDF in 24.56 MB) or read on-line. The forward by Jenkins creator Kohsuke Kawaguchi (@kohsukekawa) notes that although no code was contributed, the author makes Jenkins more approachable to new users. Smart also authored “BDD in Action” and “Java Power Tools”. The book was written in 2011 using Jenkins 1.410. The Gitter channel associated with the book. Jenkins Setup was published on May 19, 2016 .